History: The nWo's Sting, also known as the Bogus Sting, first appeared in WCW as the Cobra, a militeristic wrestler who was basically a jobber to other big stars. In September 1996, Farmer appeared, dressed as Sting, and attacked Lex Luger during a Monday Nitro taping. This caused doubt that the real Sting might have joined the nWo, which subsequently changed the real Sting's career forever. For the next couple of months, the nWo Sting and the real one battled each other regularly, usually with the real Sting winning. In 1997, after a few more brief appearances in WCW, Farmer took his nWo Sting to New Japan Wrestling, where he became a popular wrestler there. Wrestling out from under the real Sting's shadow, the nWo Sting became one of the focal points of nWo Japan. 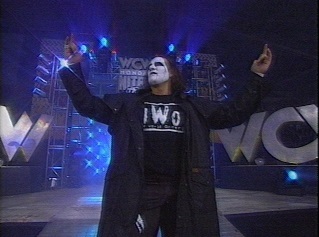 In May 1998, the nWo Sting reappeared in WCW, siding with the Giant after he and the real Sting had won the Tag-Team titles. After being defeated by the real thing, nWo Sting again disappeared from WCW, going back overseas to Japan, where he was more appreciated for his wrestling abilities. After wrestling for a time longer as the nWo Sting, Farmer changed his name, becoming "Super J", and continued wrestling in Japan, working for the fame that he gained, briefly, under another wrestler's face. - WCW Fall Brawl '96 = The nWo Sting, with Hollywood Hogan, Kevin Nash, and Scott Hall, defeated Sting, Lex Luger, Ric Flair, and Arn Anderson. - NJPW Strong Style Evolution (May '97) = nWo Sting and Syxx defeated Takashi Iizuka and Tadao Yaduda. - NJPW Budokan Hall (June '97) = nWo Sting & Masa Chono lost to the IWGP Tag Champs, Satoshi Kojima & Manabu Nakanishi. - NJPW Three Gun Tag-Team Tournament (September 12-20, '97) = nWo Sting and Masa Chono lost to Kensuke Sasaki and Kensuke Yamasaki, who went on to win the Tournament. - NJPW Budokan Hall (September 23, '97) = nWo Sting & Buff Bagwell defeated Tadao Yasuda & Takayuki Iizuka. - NJPW Super Grade Tag League VII (November 18 - December 8, '97) = nWo Sting and Hiroyoshi Tenzan competed in the League, which was won by Masa Chono and Keiji Mutoh. - NJPW Budokan Hall (February '98) = nWo Sting was pinned by Osamu Nishimura. - NJPW Top of the Super Junior '98 (May 16 - June 3, '98) = nWo Sting and Brian Adams competed in the League, which was won by Yuji Nagata and Kensuke Sasaki. - NJPW St. Valentine's Day Massacre (February '99) = nWo Sting, Masa Chono, & Akira defeated Hiroyoshi Tenzan, Satoshi Kojima, & Hiro Saito. - NJPW Sumo Hall (February '00) = Super J defeated Tadao Yasuda. - NJPW Sumo Hall (February '01) = Super J was forced to submit to Manabu Nakanishi.